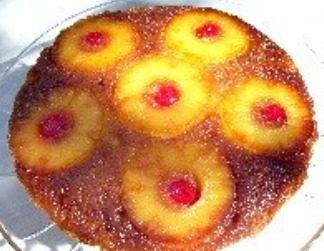 Pineapple Upside Down Cake Recipe is a simple pineapple cake recipe topped with pineapple slices, maraschino cherries and brown sugar to form a caramel glaze. This recipe was popular in the 1960's when I acquired it and is still a favorite cake of many people. Wrap cold slices in plastic wrap and pack in a lunch box for a welcomed dessert for that special person. The second recipe (in the picture) is the one I use when I want more pineapple slices. It's slightly sweeter and excellent served cold. Melt 1/2 stick butter in 8 inch iron skillet. Stir in brown sugar until mixed well. Remove from heat and top with pineapple slices. Strategically place cherries on top to decorate. In a mixing bowl, cream remaining butter and white sugar together. Add egg and cream until light and fluffy. Sift together flour, baking powder, and salt. Add flour and milk to batter and beat on medium speed of mixer for 1 minute. Pour batter over mixture in skillet and bake in a preheated oven 350 F. until light brown and done in center when probed with a knife. Remove from oven, let set 5 minutes. Loosen around edges, invert pan and let cake slide out. Serve topped with whipped cream if preferred. It is very pretty decorated with additional whole, halved, or chopped maraschino cherries. I like to sprinkle the whipped cream with a few chopped cherries and a tiny amount of maraschino cherry juice. This classic cake is awesome served with a scoop of ice cream. Melt butter in bottom of 9" round or 9" square baking pan. (I use a 9 1/2" Springform Pan). Arrange pineapple slices over brown sugar. Place one cherry in center of each pineapple slice. Cream butter on high speed. Gradually, add sugar and continue creaming until light and fluffy. Add eggs beating well after each addition. Stir in vanilla. Sift together cake flour, baking powder and salt. By hand fold into batter alternately with pineapple juice until all is incorporated. Beat batter on medium speed for 30 seconds. Scrape down sides and beat another 30 seconds. Pour batter over pineapple in pan and spread evenly. Bake in preheated oven 350F. 50-55 minutes or until cake test done in center with a toothpick. Remove from oven and let sit 10 minutes in pan. Invert and turn cake out upside down onto cake plate. This cake is excellent served warm or cold with vanilla ice cream. If baking in a Springform pan, check it for leakage before using. Lock the bottom of pan in and fill it with water. If it leaks, line the bottom and sides with parchment paper before melting the butter. You will probably have rough edges around the finished cake if you line it with the paper. Spread sides with whipped cream to hide the rough edges, if you prefer.